Angered by President Trump's declaration that Jerusalem is Israel's capital, Palestinian advocates took to the streets throughout the country during the weekend to express their anger and frustration. But the message often was telling. Few echoed media analysts' concerns that the move might hurt future peace efforts. Instead, there were taunts of what Mohamed's army has waiting for Jews and calls for new violence. "We don't want 2 states! We want 48!" was among the chants Friday night at a Times Square rally. The "48" refers to Israel's 1948 independence, and the message calls for a return to a world before there was a Jewish state. "From the river to the sea, Palestine will be free!" "Khaybar O Jews, Muhammad's army will return." A Palestine "from the river to the sea" erases Israel from the map. "Khaybar" is a taunt invoking a 7th century massacre of Jews by Mohammed's army. It is considered a "battle cry" before attacks on Jews or Israelis. 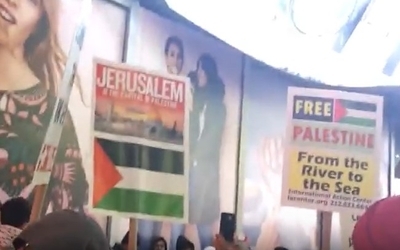 Palestinians are quick to accuse Israel of genocide – the systematic destruction of a culture and its people – a sign at Friday's rally said, "Israel= racism + genocide." Yet that's exactly what they pray would happen to Israel. We reported Friday on a Texas-imam's prayer that "Allah destroy the Zionists and their allies." The prayer generated an "Amen, amen" comment from Said Abbasy, a New York-based supporter of the "moderate" Muslim Brotherhood. Abbasy appeared pleased by the attention, confirming the sentiment in Arabic on Facebook and justifying it because "the world Zionists are my enemies, because you are all killers and enemies of humanity." Imagine what would happen if a mainstream pro-Israel advocate voiced a reciprocal sentiment. Imagine a pro-Israel rally featuring similar rhetoric – taunting Palestinians over a massacre or advocating the elimination of Palestinians as a people. Imagine a rally which demanded more violence. The international shock and outrage would dominate news coverage and debate for days or longer. But in Times Square Friday night, Mohammad Qatanani did just that. Qatanani, the imam at Paterson, N.J.'s Islamic Center of Passaic County, has spent a decade battling the government's efforts to deport him over his failure to disclose Hamas ties, told the crowd that all peace efforts should be cut off. "Our message to the Palestinian authority, you have to stop all kinds of peace process, no peace process and negotiation with the occupation in Palestine. Oslo has to be stopped and to be finished. We have to start a new intifada." He then led the crowd in chanting, "intifada, intifada!" Previous intifadas featured deadly terrorist attacks, including suicide bombings, shootings and deadly knife attacks. We have chronicled the effect blind hatred for Israel has on Palestinian advocates. It leads them to treat terrorist murderers and their enablers as heroes. It causes otherwise rational people to see no moral distinction between Israel and ISIS. No one expected universal praise for the new U.S. policy toward Jerusalem. What too many Palestinian advocates are doing here, however, is dropping any veneer of moderation or hopes for peace. They will only accept peace when an existing nation and its people are wiped.